If you�re like most Harley-Davidson owners, the only thing you enjoy more than learning about your motorcycle and how it works is getting it out on the open road. Don't let a simple mechanical issue keep you from riding your motorcycle. Extend your knowledge and ability to perform basic to complex services and procedures with a Harley Davidson repair manual from The Motor Bookstore. When you�re thinking of performing your own services or repairs on your motorcycle, it�s critical to have a source of accurate and trustworthy information to ensure you get the job done right. The Harley-Davidson manuals we sell are the best available, providing all of the details you require to maintain, fix, restore or modify your favorite ride. Published by Clymer and Haynes � both trusted names in the DIY field for decades � these Harley service manuals were created for the do-it-yourself HD mechanic. Our Harley-Davidson shop manuals are also valued by professional mechanics for containing the most current and thorough technical specifications. You�re an expert at navigating tight S-turns and controlling the throttle on your motorcycle for optimal performance. With a Harley-Davidson service manual from The Motor Bookstore, you can increase your knowledge of necessary maintenance services, fixing or replacing broken parts and even upgrading components on your motorcycle. From basic services and tune-ups to repairs and complete overhauls, owning our Harley shop manuals is like having an experienced mechanic at your side from beginning to end. Custom Motorcycles: Choppers, Bobbers, Baggers - Hundreds of Ideas, Tanks, Frames, Wheels, etc. Clymer and Haynes Harley-Davidson manuals are written by carefully chosen teams of mechanics, copywriters and photographers to ensure the information you receive is not only accurate but also easy to understand and follow. Books are written in a step-by-step format that�s accessible to even the most novice mechanics. Content is supported by hundreds of photographs, diagrams and illustrations that provide the confidence to take on even complex procedures and repairs. Within our selection you�ll find Harley repair manuals for all different models and years of motorcycles. Chapters typically cover everything from troubleshooting and tune-ups to engines, electrical systems, wiring and suspension. Whether you�re replacing a starter on a 2007 XL Sportster or adjusting the front suspension and steering on a 1999 FLT Twin Cam 88, you�re sure to find a Harley Davidson manual in our inventory that meets your needs. There are DIY Harley-Davidson guides that show you how to build a chopper, perform Harley-Davidson engine repair, design your own Big Twin, build a kit bike, hop-up your Sportster, restore your classic Harley and more. With a Harley Sportster manual or one of the other professional repair guides, nothing is beyond your reach. You can fix your Harley! These Harley-Davidson manuals are written for do-it-yourself weekend mechanics. Each system or component covered is accompanied by text explanations along with clear photos and illustrations that guide the reader through the disassembly, inspection, service or repair and reassembly of the component, including the front forks, brake system, wheels, carburetor, engine and transmission. If you're looking for a Sportster service manual, Shovelhead repair manual or a guide for repairing older Harleys, you've come to the right place! The Motor Bookstore is a family and veteran-owned company that�s dedicated to providing DIY mechanics with the information and instructions necessary to better maintain their motorcycles. We offer easy online shopping, fast shipping and free delivery within the contiguous 48 U.S. states. Take your knowledge and enthusiasm for the most legendary brand of motorcycles to the next level by placing your order for a Harley service manual today. Browse our online selection or get in touch with us for expert assistance finding exactly what you�re looking for. Our live representatives are available online or on the phone to answer all your questions. 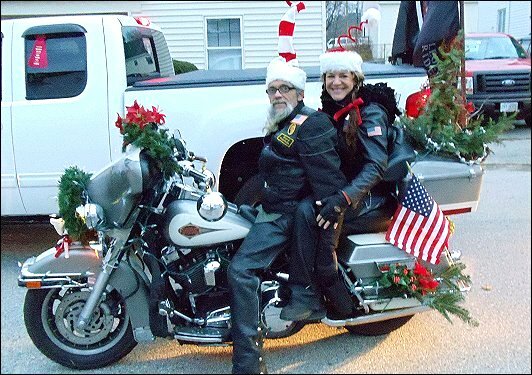 Above: Debra Spruce and Daniel Mead's 2001 Harley-Davidson Electra Glide Classic. Lebanon, ME.